"Welcome to a world where anything is possible." 5-year old Sosuke's father is a sailor. Souske lives a quiet life with his mother, Lisa, on an oceanside cliff. One eventful day, he finds a very beautiful goldfish that is trapped in a bottle on the beach. When he rescues her, he gives her the name, Ponyo. However, she is no ordinary goldfish. She is the daughter of a masterful wizard and a beautiful sea goddess. 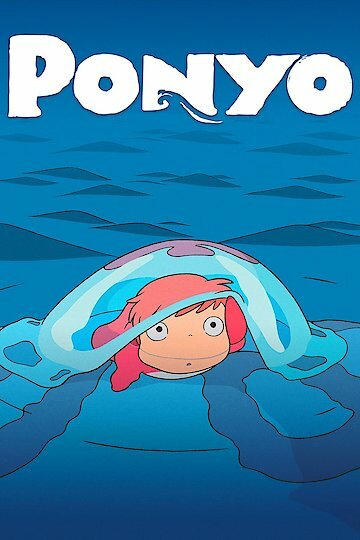 Ponyo decides to use her father's magic to transform herself into a little girl and she falls in love with Sosuke. However, with the use of such powerful sorcery, it causes a dangerous imbalance in the world. The moon steadily draws nearer to the earth and Ponyo's father sends the ocean's mighty waves to find his daughter. The two children commence on an amazin adventure of a lifetime to save the world and fulfill Ponyo's dreams of becoming real human.